This activity provides an engaging real-life context to investigate simple combinations, and is designed to be accessible to secondary maths students at Key Stage 3. Arsene Wenger is planning the formation for next Saturday's game. The picture shows the ten outfield players lining up in a 4-4-2 formation (four defenders, four midfielders and two strikers). This is the most common football formation. Do you know any other common formations that Arsene Wenger might choose? To create a football formation, he needs to arrange the ten outfield players in three rows: defenders, midfielders and strikers. How many different ways can ten players be arranged? Some of the arrangements would never work in a real football match. For example, you would never have just one defender! Which of your arrangements do you think are unrealistic? Wenger decides to arrange the players over four rows instead of three. Can you develop a strategy for working out all the different formations over four rows? Unfortunately, one of the players is unfairly sent off at half time. Can you adapt your strategy to find all the different possible formations with nine players? 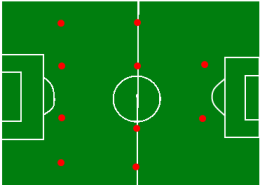 Dividing the ten outfield players in different ways is an example of a partition. You can read more about partitions in Number Theory here.